Middle school signals the beginning of an adult approach to academics and studying. The switch to multiple classes with different teachers prompts students to juggle deadlines and learn valuable time management skills. That’s why it’s critical that they develop strong study skills now to help them through middle school, high school, college, and beyond. Here are four tips to get your student started. Is your child a visual learner, an auditory learner, a kinesthetic learner, or a combination of those styles? Once students know how they learn best, they can use learning techniques that complement their needs. Read up on how to find and adapt to your child’s learning style. Televisions and smartphones are distractions that hinder good time management. Set up a study room away from the TV and ask your child to put his or her phone in the kitchen. Encourage your child to do as much studying or homework as possible before doing any research on the Internet, which can break concentration and lead to surfing. If he or she has a paper to write, your child can create an outline first and then do the online research once he or she has a general idea of how the paper is laid out. If your child is having trouble with motivation or focusing for a longer period of time, start small. Ask him or her to go to the study area and work for 15-20 minutes. Then your child can take a short break, perhaps to play a quick game on the smartphone, and return to studying for another short interval. Gradually increase these intervals to 30 minutes, then 45 minutes, and on. Which option would motivate your child more: starting with a subject he or she doesn’t like, so that the reward comes by eventually getting to the subject he or she enjoys; or would starting with the subject he or she likes get the studying underway sooner? Research effective reading and memory improvement techniques to help your child be efficient when studying. This website offers tips on acronyms, acrostics, and how to read effectively. Making an effort to help your child improve his or her studying skills is the first step to achieving academic success as an independent teen and adult. These skills will help your child for years to come, so start today. For more tips on helping your child through the middle school years and reaching academic milestones, read the YOU: Your Child’s First Teacher books, available on Amazon. Ah, my favorite season: autumn. I don’t know about you, but here in the Midwest, fall could be a very short season for us. That is why as soon as the leaves start changing colors, I have most of my weekends booked for family fun. From Halloween baking to carving pumpkins to hayrides, I put together my favorite adventures so you can try them with your family. Halloween treats are so fun to make… and to eat! Check out my article, 5 Healthy and Creative Halloween Party Foods, for Halloween-themed recipes to make with your family. Impress at a party with these Pinterest-worthy designs. Instead of buying decorations for fall, spend a Friday night together making kid-friendly art. A Spectacled Owl has a great list of fall crafts you can make with the family. Carving pumpkins seems to have decreased in popularity, which is pretty sad because it’s awesome! Put down the technology and get your hands dirty with this fun adventure. The Pumpkin Lady offers how-to videos and hundreds of pumpkin-carving stencils to choose from. Depending on where you live, a pumpkin patch or apple orchard could be anywhere from 20 minutes to two hours away from your house. Plan a day trip with the family—you wont regret it! Many have hayrides, petting zoos, pony rides, and more. If you are tight on cash, visit for a sightseeing trip instead. The scenic views of the red and orange-hued trees are worth your while and even serve as an opportunity to teach your child why leaves change colors. Whatever you choose to do for the season, make it a tradition with your family. What starts as a small event one year could be an everlasting memory for your child for years to come. What are your favorite fall family activities? Tell me in the comments below! Friendship in middle school is a complicated thing. Casual friendships can end with a mood swing or a sudden need to be more popular. But these mood swings or changes in social status can result in something more dramatic and way less cool: bullying. I transferred to a new school district for middle school. It was hard for a new kid to make friends, but I was fortunate that a group of people welcomed me into their circle. Unfortunately, the day came that one of those girls decided to bully me. She was the girl who chose to pick on someone new each day. I knew she did that and didn’t agree with it, but since my friend options were limited, I never stood up to her or defended those she would bully. Inevitably, one day it was my turn. While in the library, she walked up to me and started threatening me. I was confused and asked her why she was acting like that. She responded by pushing me. I tried to leave, but she pushed me again; this time with such force that I tripped over a cart and my head hit a table. At the emergency room I received four stitches on the side of my head. I have other, less dramatic stories about girls making fun of me because of awkward grooming issues, like knowing when to shave my legs and how to pluck my eyebrows. These comments not only injured my self-esteem, but they led to an overwhelming feeling of isolation and suicidal thoughts. While my parents obviously knew about the bullying incident in the library, how would they know about the smaller, less severe but more frequent episodes? Like many kids, I didn’t want to tell my parents because I was ashamed and embarrassed. Instead, I acted like nothing was wrong so they wouldn’t notice. So how can parents help their children if they don’t know what’s happening in the hallways? Worried about elementary school bullying? Read this article. According to a UCLA psychology study, popular students are more likely to become bullies, and students often become more popular if they bully others. It seems silly to pay attention to things like popularity, but if you know where your child is on the social popularity scale, you can look for signs of being a bully or a victim. For instance, if your child isn’t in the popular crowd, it’s important to get a sense of how he or she feels about that. If your child isn’t happy with his or her friend circle, look for signs he or she might be bullying others or be a victim of bullying. Pay attention to behavioral changes. Talk to your child about his or her friends and the other kids in school. Get an idea whether your child feels like he or she fits in. If your child was once confident and starts to lose self-esteem, ask about their friends. Is your child trying to change social circles or is your child happy and satisfied with his or her social life? If your child won’t speak to you about it, talk to his or her friends’ parents to see if you can get an idea of what’s going on. If that’s not an option, share this woman’s story about middle school bullying—it might spark a conversation and help you find out how your child is doing. Look for physical signs of bullying. If your child is being physically bullied, it won’t be difficult to spot the signs: bruises, scratches, ripped or unusually dirty clothing. But if your child is being verbally bullied, it will be harder to recognize the signs. Many children who are bullied will start feeling physically ill before returning to a place where they have been bullied. I used to get horrible stomachaches before going to the classes where students would tease me. If your child starts having more instances of upset stomachs, headaches, colds, etc., ask if kids are making fun of them. They might not expect that question and are likely to give you an honest answer. Understand that bullying can happen anywhere: in the hallways between classes, at the desks before class starts, on the walk home from school, even—in my case—in the library with teachers looking on. Recognize the signs and reach out to your child before it takes a toll. Learn more about bullying and how to help your child develop a healthy self-esteem in the YOU: Your Child’s First Teacher book series, available on Amazon. Every October during National Bullying Prevention Awareness Month, we focus on how to prevent bullying and how to address it when it happens. Every parent can agree that we don’t want our children bullied and we don’t want our children to be bullies. But how can we prevent both parts of this behavior? When is it bullying and when is it just young kids working out social differences? One challenge in bullying prevention is teaching a child to stand up for him or herself but also teaching them when to seek help from an adult. We don’t want to coddle our children or encourage “tattling,” but we do want them to resolve bullying when it happens so that it doesn’t have a long-term effect on their emotional or social well-being. You can set a good foundation with your child by watching this “Happy to Be Me” segment from Sesame Street together. Talk to your child about whether he or she has felt like Big Bird. Has your child been made fun of because of how he or she looks or talks? Has your child been left out of activities intentionally? Then ask your child what he or she did when that happened. Use the discussion tools that accompany this clip. By learning how your child dealt with a previous issue, you can determine if you need to step in and talk to the school or if your child seems to be handling it well. Remember that this is just an initial discussion. Even if you discover your child faced bullying and handled it well, you still need to check in regularly to ensure the bullying doesn’t continue and his or her self-esteem is developing. For more information on how to address bullying at the elementary school level, pick up the YOU: Your Child’s First Teacher books, available on Amazon. It’s difficult to come up with healthy, satisfying treats for children at Halloween parties, so I recently took on the challenge. Not only did I try to find amazing recipes for all ages to enjoy, but I also tried to make the food so appealing that the kiddies would beg for more! These recipes were the biggest hits for the eyes and the taste buds. Bring these fun treats to your child’s classroom Halloween party or to the family bash you’re throwing this year. First, slice the banana in half. Insert the skewer or wooden/plastic stick into the thick end of each banana half. Place the bananas on wax paper or a plate and put in the freezer for at least three hours. Once the bananas are frozen, place the white chocolate in the microwave (30 seconds) or in a pot on the stove to melt. Stir it frequently. I recommend putting the melted white chocolate in mug so it’s easier to dip the banana into. Dip the bananas in the white chocolate one at a time and then place on the wax paper. Quickly add the chocolate chips or raisins for the eyes (and mouth if you prefer) before the chocolate hardens. When finished, place back into the freezer until ready to serve. Photo and recipe via Dine and Dish. This is a fun and quick recipe. First, make sure you have a rectangular platter. Spoon the guacamole onto the platter using a flat-edged rubber scraper to shape the guacamole. 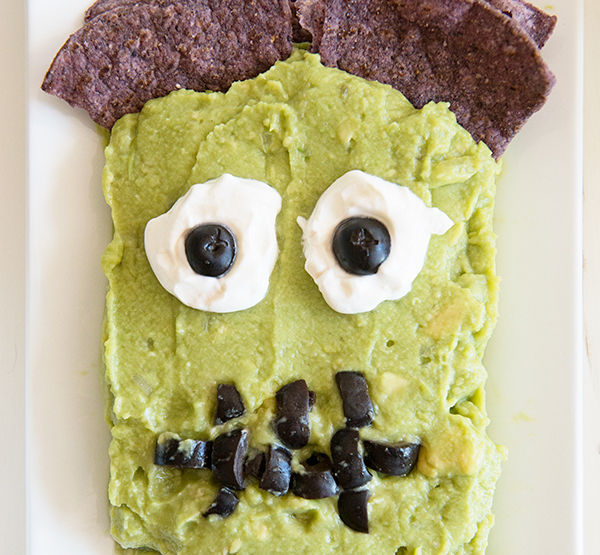 Place the blue tortilla chips near the top of Frankenstein’s head with the triangle tip pointing downward. Add two dollops of sour cream a few inches under the chips onto the guacamole for the eyes. Place a sliced black olive in the middle of the sour cream eyes, with the hole of the olive facing down. As for the mouth, I recommend looking at a picture of Frankenstein to get the idea. Push sliced olives with the rounded edges facing up into the guacamole. Recipe and photo via Jeanette's Healthy Living. Scare the kids with this healthy treat! Preheat the oven to 425°F. Toss the cut up cauliflower with the olive oil and season with salt and pepper. Place a piece of parchment paper onto the baking sheet. Roast the cauliflower for about 20-30 minutes or until tender. In a food processor or blender, combine the roasted beets and pine nuts, blending until the nuts are finely ground. Add olive oil and vinegar and blend again until smooth. Use a spoon to smear the roasted beet hummus or “blood” on a plate and top with the “brain,” (the cauliflower). Photo and recipe via The Girl Who Ate Everything. This was super fun to make. While it’s more delicious than healthy, you can vary the recipe to swap a gluten-free version of the cookies if needed. Prepare cookies as directed on package or according to your favorite recipe. Once the cookies are cooled, cut each in half for 48 halves (assuming you make 24 cookies). Then, frost the bottoms of all the cookie halves. Place six marshmallow teeth around the curved edges of 24 halves. Place the other frosted cookie half on top of the marshmallows. Insert two almond slivers in between the teeth for fangs. If the fangs do not stay put, dip the tips into the frosting. Photo and recipe via Blissful Basil. Did you really think I was going to give you five recipes and not include pumpkin? You can decorate this fudge how you please after it’s made, but here is the basic recipe that is “vegan, gluten-free, paleo, and free of refined sugars,” according to Ashley at Blissful Basil. Place all the ingredients in a medium saucepan over slow heat. For 3-5 minutes, whisk constantly until everything is melted. Using coconut butter, grease a small container (3x5 or 4x6) and pour the mix into the container. Freeze for one hour. Remove the block of fudge from the container by turning it over and tapping until the fudge releases. Cut the fudge up into small slices and store in the refrigerator (for soft fudge) or freezer (for firm fudge). What are your favorite healthy Halloween recipes? Share with us in the comments below.